By becoming a Sunrise Trail Coalition (STC) Member, you will help support the trail maintenance, amenities and special events. Members are encouraged to attend and participate in STC meetings and events and can help shape the future of the trail by serving on committees or as STC officers. Business members may purchase directional signage to display on the trail or at trailhead kiosks to direct visitors to their business. 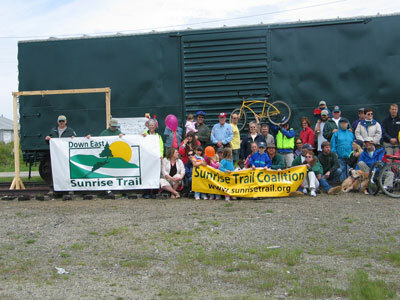 The Sunrise Trail Coalition is a publicly supported non-profit charitable 501 (c) 3 organization. Dues are tax deductible. Is your form complete? If so, you will be redirected to a payment page when you hit submit. Download and print membership application/renewal form. The Sunrise Trail Coalition: Building a healthier, more prosperous future for Hancock and Washington counties.